Herbert Walter Roesky is an internationally acclaimed inorganic chemist, known for his ground-breaking work on fluorides of transitional and normal metals. He was born on November 6, 1935 in Laukischken, Germany and received his PhD from the University of Göttingen in 1963. From 1971-80 he was Professor of Inorganic Chemistry at the Johann-Wolfgang-Goethe-Universität, Frankfurt am Main, and served as Director of the Institute of Inorganic Chemistry at the university from 1973-76. In 1980 he became Director of the Institute of Inorganic Chemistry at the Georg-August-Universität Göttingen, a position he held until 2003. Herbert Roesky is currently a Professor Emeritus at the University of Göttingen. Dr. Roesky has received numerous awards and honours including: Centenary Lecturer, Royal Society of Chemistry (1985), Leibniz Award (1987), Alfred-Stock-Memorial Award (1990), Wilkinson Prize (1997, 1998), Grand Prix de la Fondation de la Maison de la Chimie (1998), ACS Award for Creative Work in Fluorine Chemistry (1999), ACS Award in Inorganic Chemistry (2004), Rao Award of the Chemical Research Society of India (2004), Wittig-Grignard Award (2004/05) and Prix International Henri Moissan (2009). He is a member of the Academy of Sciences Göttingen, Academy of Scientists “Leopoldina” in Halle/Saale, the Russian Academy of Sciences, Associé étranger de l’Académie des Sciences, and an Honorary Member of the Romanian Academy. 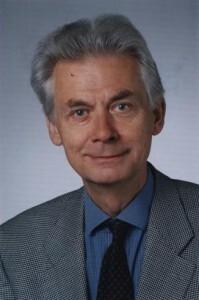 He served as President of the Academy of Sciences at the University of Göttingen from 2002-2008. He has received honorary degrees from University Bielefeld, Masaryk University Brno, University of Bucharest, Université Paul Sabatier, University of Missouri, Columbia and Université Bordeaux in France. In 2010 he was named Adjunct Professor of Banaras Hindu University in India.